On August 20, 2018, Mr. Chaiyong Puapongsakorn, Governor of the Metropolitan Electricity Authority (MEA), and Mr. Bundit Sapianchai, President of BCPG Public Company Limited signed a MOU on Renewable Energy Trading Scheme to study the feasibility of the development of renewable power production and energy management or other mutual agreement businesses at Intercontinental Hotel, Bangkok. The MEA Governor said that, as a leading electric power organization, MEA has realized the importance of renewable energy while always using technologies to increase the stability of power systems. In this collaboration, MEA played a role in data analysis and examined possibilities for carrying out projects that the two parties jointly developed in MEA’s distribution areas, such as the pilot smart green community project (T77) on Sukhumvit Road, the smart grid project and the digital energy project. They created a framework for collaboration over a 2-year period, which would help MEA achieve results and get ready for a variety of power needs with stability and efficiency while upgrading its business to provide a full-scale service for the public. MEA has consistently implemented projects on technology and renewable energy such as the Smart Grid, the Solar Rooftop for large government agencies and the MEA Smart Life Application for customer convenience. MEA has been the first agency to use electric vehicles (EV) for operations since 2012 as well as research and development until it can build the EV Charging Station on its own. The MEA EV Application on IOS and Android smartphones has been made for drivers to boost the use of electric cars in Thailand with a function to search charging station and book charger in real time, available in every mobile network, and a navigation feature to bring you to the charging port and control the charger through a remote system. The App can show charging history, calculate energy saving rate, etc. MEA also supported all public and private units to call for more use of electric cars instead of fuel cars in the future. Mr. Bundit Sapianchai, President of BCPG, said the use of clean energy in Thailand has been increasing due to the advance of technologies and lower costs. Consumers are more interested in producing clean energy for their own use while the industrial sector is keen on using clean energy to reduce operating costs and save the environment. The increase in clean energy production needs efficient energy management through the use of digital systems for more convenience and less time. Looking at new energy trends in the future, consumers will become the center of ‘Value Chain’ and energy production will come from alternative energy sources in different areas while getting nearer to consumers (Distributed Energy Resources). As a renewable energy producer, BCPG is committed to investing, developing and operating green power plants with modern and environmentally friendly technologies. Its business has been developed for the clean energy trend with state-of-the-art innovations by employing blockchain to trade electricity in the form of peer-to-peer transactions with the collaboration of domestic and overseas partners. The MOU signing is another important step for BCPG and MEA to co-develop renewable energy and electric power management for stability, efficiency and sustainability. 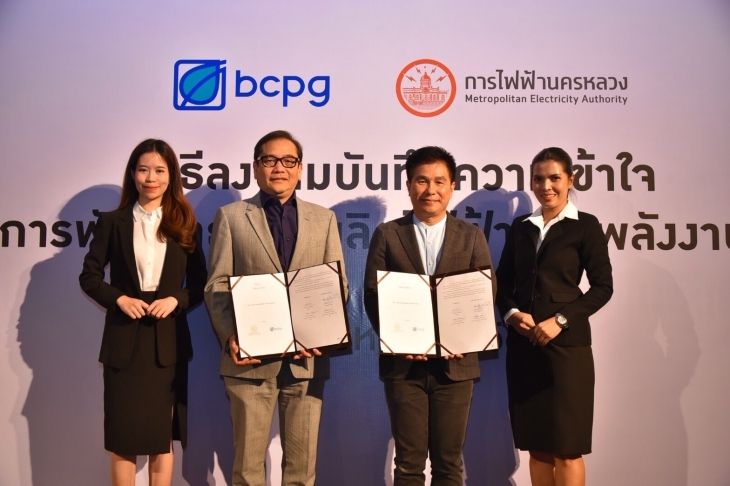 The smart green community, T77 project, is a collaboration between BCPG and Sansiri Public Company Limited, and will commence trial on August 22. MEA has provided support as a state agency who always recognized the importance of using technology to drive business forward and created innovations to provide services under the smart metro concept – a vital part in power distribution network so that residents can balance their own energy production with the power transmission lines from MEA’s grid. The collaborations also included the power grid upgrade, the energy storage system and the use of Digital Platform to help manage energy efficiency in a cost-effective way for the best benefits of the country in the long run.